Aztech Cutting Solutions is proud to offer you the very best in green cutting services. 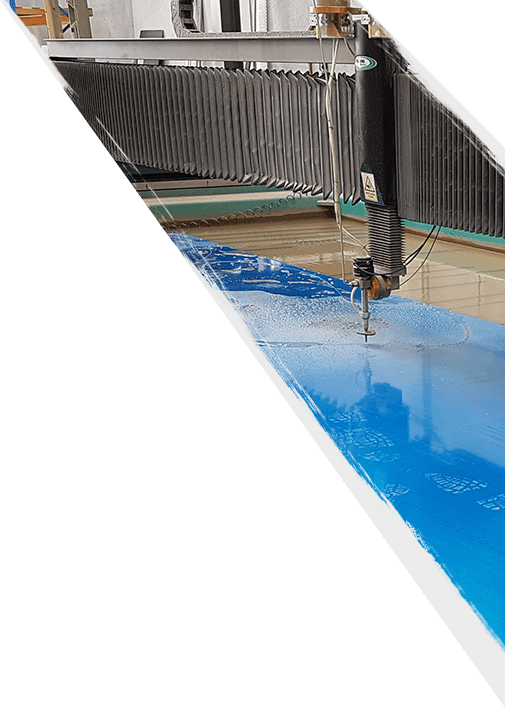 Our unique waterjet cutting techniques provide a precise, reliable and environmentally sound alternative to traditional cutting methods. For this reason, we have become the team of choice for many small businesses and high profile clients alike. We are here to help you get a fantastic result on your construction or fabrication project. What’s more, our services are available anywhere in Australia! Here are some testimonials from some of our satisfied clients. Our innovative methodology utilizes leading edge technology, embracing 3D modelling and CAD CAM processes with traditional artisan care. Crucial to our work is the quality of the chain of suppliers and subcontractors, and to this end Aztech Cutting Solutions has no peers. Aztech are reliable, efficient and dedicated and consistently provide solutions to help resolve and deliver the complex work required. DCG Design will only use Aztech for precision waterjet cutting. We have been using Aztech Cutting Solutions for a number of years now and we find their ongoing service and quality of work to be exceptional. The team is extremely helpful and very easy to deal with; they are definitely our go to with all cutting requirements. We look forward to continuing the great working relationship we currently enjoy. Aztech provides us with great service and a super fast turnaround for all our orders. We thoroughly enjoy working with Aaron and Warrick and see a long future together. We cannot recommend AZTECH any more highly. Aztech Cutting Solutions are true masters of their craft and have become an integral partner, through many years of quality service. Their extensive knowledge, attention to detail and consistent quality results, has firmly cemented them as leaders in the industry. I would like to take this opportunity to let you know we are extremely happy with the parts you have been waterjet cutting for us on a regular basis. The consistency has been excellent, and we have the time frames working extremely well for us now. I would be pleased to refer your services to anyone who has a need for them. I’m sure we will be working together for a long time to come. Well done guys. I would just like to take this opportunity to thank you and your staff for the prompt and professional service you provide to our business on a regular basis. The quality, precision and consistency of your work has really made a big difference to our end product and we’re extremely grateful for this service. I would have no hesitation in recommending your business to anyone looking for profiling solutions. We look forward to continuing this seamless working relationship we have for years to come. It is a pleasure dealing with Aaron and Warrick, they run a professional operation. There is no doubt they will have great success in the future.